Amakulu ge kibiina kyobufuzi ebifananyi bino byoleka bulungi amakulu gakyo. Ebifananyi bino bili ddala wakati mu Buganda. Dr Margaret Mungherera, the former president of the World Medical Association, died of cancer last week. As a tribute to one of the world's most respected and outspoken health rights activists, we republish this feature about Mungherera by BAMUTURAKI MUSINGUZI first published by The Observer in January 2014. When Ugandan psychiatrist Margaret Mungherera was voted unopposed as president-elect of the prestigious World Medical Association (WMA) – the event conjured up bitter memories when she was refused to practice medicine in Britain 28 years ago. Mungherera had travelled to the UK to pursue a diploma in Tropical Medicine and Hygiene at the London School of Tropical Medicine and Hygiene in 1984, after completing her internship at Mulago hospital a year before. 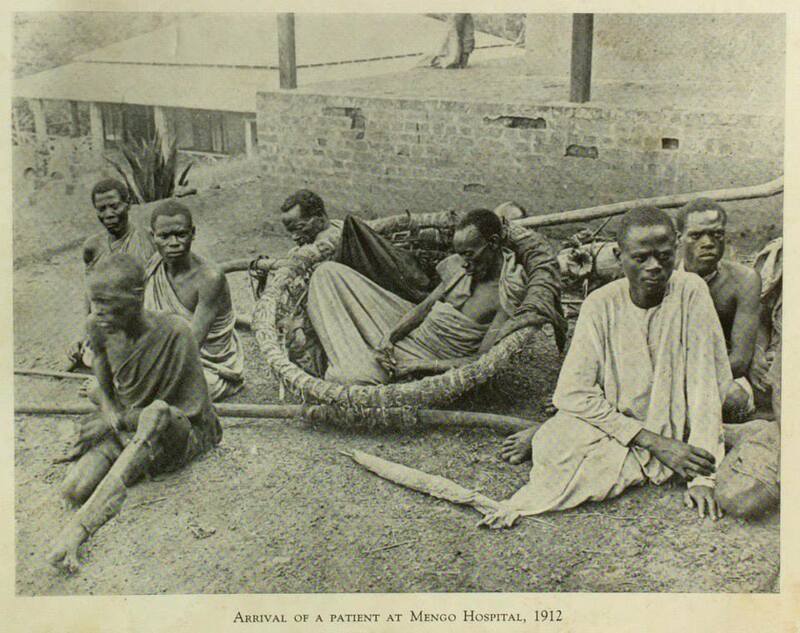 In 1980 the General Medical Council in the UK had banned doctors from a number of countries, Uganda inclusive, from working in England for various reasons, including the insecurity in Uganda then, and an alleged decline in standards here. Hence while Mungherera’s classmates from India, Nigeria and Ghana were allowed to practice, Ugandans were rejected as unworthy. “For us personally as doctors we felt sort of downgraded and humiliated. It meant that if you could not work in England, then you could not work in Germany, France or Europe,” Mungherera says. She recalls that even when they were admitted, they were told they could not touch patients, meaning that it was going to be a theoretical course. Mungherera’s highest personal recognition came in October 2012, when she was voted WMA president-elect for 2013-2014 at the association’s annual General Assembly in Bangkok, Thailand. A year later, in Fortaleza, Brazil, she was installed as president at the WMA general assembly. WMA, acting on behalf of patients and physicians, endeavours to achieve the highest possible standards of medical care, ethics, education and health-related human rights for all people. “When I was taking up this post, the people who actually looked for me were from the British Medical Association. I also had doctors from the American, German and South African Medical Associations who actually rallied and convinced me to take up this challenge. And so when I was declared unopposed at the meeting in Bangkok last year, the first thing that came into my mind was how I felt that afternoon when I was not allowed to register in the UK,” Mungherera says, remarking what a “wonderful thing” it is that the British now think a Ugandan can lead. Mungherera is only the third woman to head the 66-year-old association, after Dr P. Kincaid-Smith from Australia (1994-5) and Dr Kati Myllymaki from Finland (2002-3). And she is the second African president, after South Africa’s Bernard Mandell (1996-7). She sees this as more evidence to a gender-imbalanced world – that women can ably lead. “As president, I am going to be the ambassador of the association. I will be the mouthpiece and spokesperson. I will represent WMA at the United Nations and World Health Organisation meetings and other bodies that have a relationship with the association. I will also be visiting national member associations especially where health workers have challenges. If, for example, they have unfairly detained a health worker or where rights of health workers are being violated,” she says. Mungherera has been a medical doctor for over 30 years and a psychiatrist for 20 years. She specializes in forensic psychiatry at Mulago teaching and referral hospital. She also has responsibilities as the clinical head, directorate of Medical Services (departments of Internal Medicine and Psychiatry). In addition, she is a senior consultant psychiatrist at Mulago hospital, in charge of psychiatry emergency services. 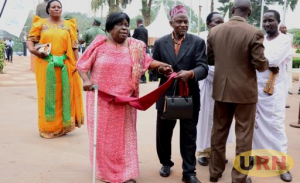 Mungherera is a founding member of the Association of Uganda Women Medical Doctors and was the first woman to be elected honorary president of the Uganda Medical Association (UMA) since its formation in 1963. She is also its longest-serving president – 1998-2005 and again from 2010 to-date. As WMA boss, she hopes to tackle the challenges of delivering quality healthcare to millions around the world. And she articulates the problem clearly. “I think the main challenge is that there is a human resource crisis all over the world whether you are talking about high, middle or low-income countries. The most affected areas are the low and middle-income countries. In terms of migration there is a lot of internal and external migration. People are migrating from the South to the North. People are even migrating within their countries from rural to urban areas. 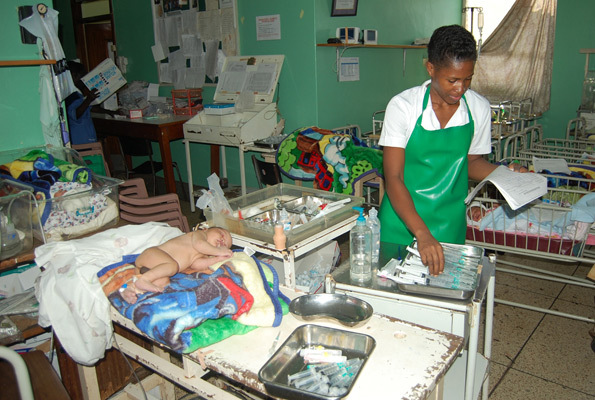 So, there is a lot of inequality in terms of distribution of health workers,” she says. “I also think that the profession has low numbers but also there is a shortage of skills. The skills that are necessary now are to do with the new diseases that have emerged. For example, we as doctors should no longer keep sitting in our clinics; we should be out there doing advocacy, public awareness and health promotions. “The diseases have changed; we should be talking about lifestyle, more than infections. [Of] course infections are important but lifestyle is a very important issue now. The other challenge as new diseases and epidemics emerge, there is reduced resources for health care. In most countries health care resources are going down,” she added. To address these challenges, Mungherera suggests that governments should show more commitment and increase funding for the sector. And the private sector, too, should be more involved in providing solutions. Mungherera also stresses that research has to be the pillar of efficient healthcare systems. According the former WMA president, Dr Cecil Wilson, there is no doubt Mungherera will make a great president. “In talking with Dr Mungherera about her vision for the WMA, what comes through loud and clear is a dedication to bringing the disparate member organisations of the WMA together,” Wilson wrote in his blog posted on the WMA website. The principal medical officer in charge of mental health at the Ugandan ministry of Health, Dr Sheila Ndyanabangi, describes Mungherera as a charismatic, driven, outspoken, and truly emancipated woman. 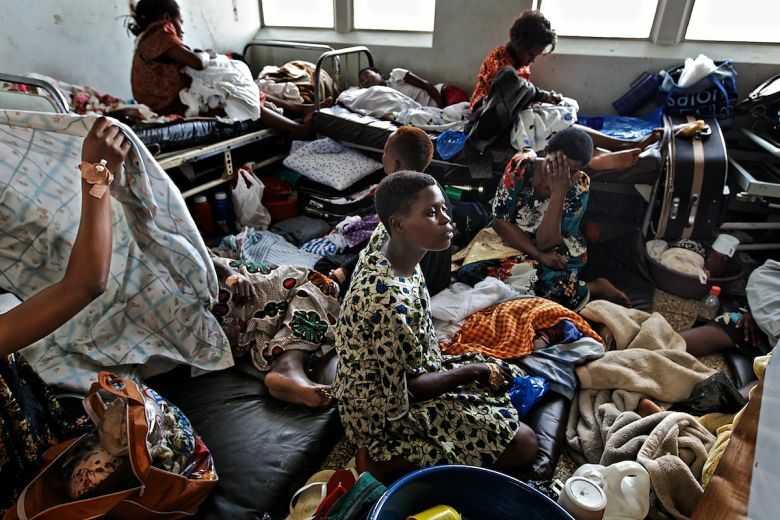 A particular area of concern for Mungherera is the delivery of psychiatric services in Africa, which are hindered by challenges such as the stigma associated with mental illness. Mungherera notes that immunization is not the responsibility of the health sector only but a multi-sectoral issue that calls for adequate funds for social mobilization. Mungherera observes that the medical sector in East Africa is developing with the input from the private sector but more resources are required to gain higher growth. “Things would move faster if we had more resources and especially the human resource. However, in the last 20 years a lot has changed in the way we manage and prevent diseases, and the number of skilled professions has increased. With more resources we can actually get where we can say it is of good standard,” she adds. Mungherera has expertise in training health professionals and community health workers (CHWs), mental health and forensic medicine research, human rights advocacy, non-profit organizational governance and development. In 2000, Mungherera initiated discussions between national medical associations in Uganda, Kenya and Tanzania, a move that culminated in the formation of the Federation of East African Medical and Dental Associations. A significant achievement of the federation has been to bring together for the first time national medical associations to work with their regulatory bodies in the Eastern African region (Uganda, Kenya, Tanzania and later Rwanda and Burundi) to strategise and plan for a joint effort to promote standards in training of doctors, regulation, continuing professional development, cross-border disease surveillance and emergency response. President Yoweri Museveni appointed Mungherera a member of the Judicial Commission of Inquiry into the Global Fund for HIV/Aids, TB and Malaria (2004-2005) and member, Public Universities Visitation Committee (2005-2006). Mungherera, who was born on October 25, 1957, has five siblings, including four medical doctors. She is married to Richard Mushanga, a retired banker, and she has an adult step-son and four grandaughters. Of late these are the modern African medical professionals who seem to have suffered the fool concerning the self inflicted poverty of the country of Uganda. 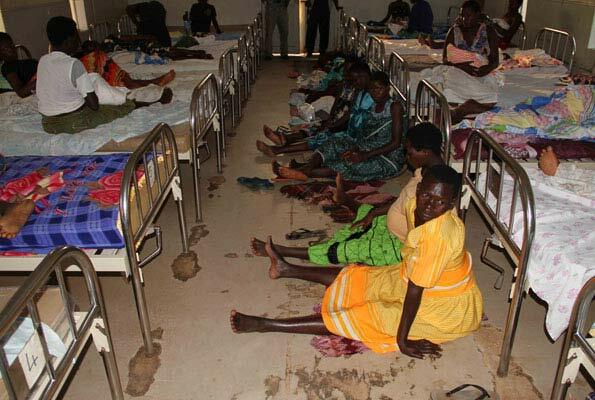 The country of Uganda cannot be struggling to own and use only one cancer treatment machine out of about 50 modern British style hospitals flourishing nationwide. It is a disgrace. Greetings! I had hoped to speak with you in Kampala just before Christmas day, but the vicissitudes of life and the messiness of our city made it a little difficult. Before long, I was back to base in Chicago. One of your aides intimated that you had recently asked about me. And coincidentally, one of the ardent readers of this column, Samuel, not too long ago wanted to know if I knew what you are up to lately. I promised him I would put the question to you directly. Unfortunately, I didn’t get a chance to. Meanwhile, I was meaning to write you a line on the email when news broke through with a bang: you are in talks with Uganda’s chief fighter, Ssabalwanyi General Museveni, through your daughter Rachel. This news has attracted indignation, at least on social media. The two brothers running the affairs of the country of Uganda. Ugandans who are sick and tired of Museveni’s decadent rule are resolutely hostile to any rationale for meeting with and talking to a man you so diligently served. 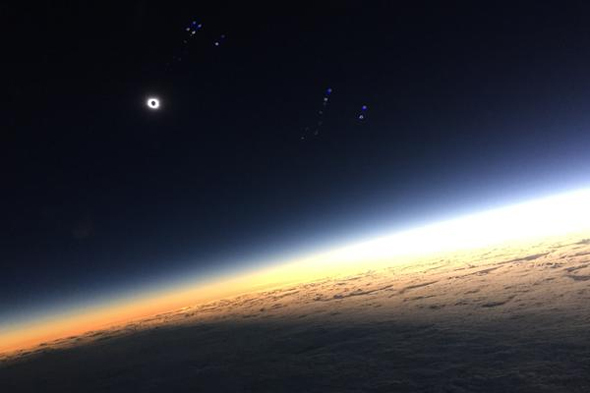 I have a different view, though. The issue shouldn’t be about meeting or not meeting, it’s about why you have to meet and talk. You sure should meet Mr Museveni and speak to him candidly. I don’t wish to sound presumptuous, but if you may permit me, I should like to remind you something you know all too well. Museveni has a knack for humiliating those who oppose him, chiding anyone who disagrees with him, discrediting and assaulting whoever threatens his grip on power. NRM swimming in cash money. I suspect that you are a man who prides in his honour and integrity. The last thing you want to do is crawl back to the Ssabalwanyi begging for favours and access to state largesse. The late Eriya Kategaya went through that ignominy and must have died a depressed man. At any rate, you should savour a meeting with Museveni and tell him more forcefully what you have told him in the past: that his time is up. Tell him it is in his best interest to work out an exit plan before it becomes inevitable to depart disgracefully. Impress upon him not to wait for 2021 because he should have already left, anyway. Tell him that harkening back to the Constitution is hollow. 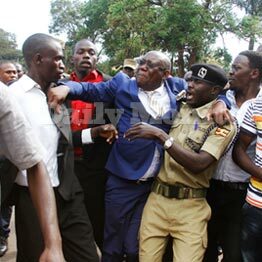 The Constitution was long abrogated, otherwise, we wouldn’t have flagrant disregard of court decisions, abuse of court processes, and illegal use of force especially at the behest of a partisan head of the Uganda Police Force. So, there is no constitutional order to talk about. As you know, with your explicit involvement and enthusiastic participation, the infant 1995 Constitution received a severe knockdown in 2005. It was damned beyond redemption. The country will need a new Constitution once the current system is set aside, one way or the other, in the near future. That said, Ndugu, I should like to propose that you use the opportunity of meeting your old comrade to persuade him that he is out of touch with the real problems of Uganda. He needs to clear the way and create the space for a new leadership that can reimagine a new Uganda and forge a better future. The illusion that it is him to save our country and the mass of our compatriots from intractable socioeconomic and political problems has driven the country to a cliffhanger. The insecurity borne of a dubious long stay in power has bred blatant nepotism and a bloated personal security apparatus, weighing heavily on the national budget. Remind General Museveni that the longer he has clung on, the more he has set up the country for a dangerous end to his rule, something that seems to have attracted disquiet from right inside his family environs, if the ramblings of one of his sons-in-law is to be taken at face value. The writing is right on the wall. Remind him that there are many historical lessons to look to if at all he is in doubt as to how the course of history can sometimes unfold following its own laws and in total disregard of human ingenuity and logic. Uganda is not at all inoculated against the kinds of tragic events we have seen in other countries where rulers cling onto power, effectively undermining and undoing whatever progress in place and leaving behind ruins when finally forced out. I understand that General Museveni is not particularly keen on taking advice, never mind the over 100 advisors. But if you can impress upon him the urgency of his exit from power, you will have done a great service to the nation, arguably more important than what you did as a government official for three decades. The next time I am in town, I will be sure to seek you out about receipt of, and reaction to, this letter. I hope you will still be holding your own in opposing life presidency and family rule in Uganda. The author teaches political science at Northwestern University/Evanston, Chicago-USA. The message this writer is making has already been made through the recent expansive General Election of 2016. Mr Mbabazi has a very sick wife and with the advice of his strong daughters, there is not enough money in the family to treat their mother of cancer all over the world's medical hospitals. Eddwaaliro ly’e Kawolo bwe lifaanana. ba Ganda Boys okuli Dennis Mugagga ne Daniel Ssewagudde baatonera eddwaaliro ly’e Kawolo ebikozesebwa ebibalirirwamu doola 15,000. Bazzeemu okukola ekintu kye kimu bwe bawadde eddaaliro lino ekyuma ekibikka abaana, kompyuta n’okulirongoosa, wamu n’okutonera essomero lya Lugazi Community Primary kompyuta. John Weeraga yasisinkanye Dennis Mugagga n’ayogera ku bukulu bwa Bannayuganda okwagala ebyabwe. Mmwe musobodde mutya okusigalawo wadde mweyubula okuva ku Da Twinz okudda ku Ganda Boys? Twatendekebwa bulungi. E Namasagali twalina Fr. Grimes eyatuwa entandikwa, n’atulaga vizoni ennyimba zaffe kwe zisobola okuvuganyiza e Bulaaya naddala mu by’okuzina n’okukuba ebivuga. Twatuuka ekiseera ne tumanya nti tusaanye okweyubula, singa twakomawo nga Da Twinz, wano wanditumize. Naye twamanya kye tuli, myuziki wa Uganda ky’ali ne kye tuyinza okuguza Abazungu. Jjuuzi twabadde ku siteegi ne bakafulu mu kuyimba nga 65 ku siteegi y’emu, nga bo batukubira ebivuga (orchestrar) ng’eno bwe tuyimba. Bo Bazungu ffe tuli Bannayuganda! Bonna baabadde n’obuyigirize obusinga ku bwadokita. Naye ggwe bw’oba n’obukkakkamu, n’okkiriza ky’oli. N’omanya nti bo balina kye bamanyi, naye naawe by’oyimba tebabimanyi olwo ojja kumalako. Ffe ne tuyimba ‘Agawalaggana mu nkoola’, nabo ne bakuba ebivuga byabwe okusinziira ku bwe tuyimba, ne tuzina, abawagizi ne banyumirwa oluyimba! Kino abayimbi ba Uganda kye batannayiga, baagala kufaanana nga Bazungu sso ng’ebyabwe tebabisobola. Naye ebibiina ebimu nga Eagles bisasika? ABO baali basobola okukwatagana ne beeyubula, ne bafuna abawagizi abaggya ebweru ne mu Uganda. Bandizuddewo engeri y’okumanya muyimbi ki mu bo akaddiye, bayinza kumuggyawo oba kumuyubula batya ne bayingizaawo n’abaana abato? Abazungu bakikola nnyo, oyo akaddiye talwana na mwana muto ng’ayiiya ennyimba ezijja okubaswaza wabula asigala ayimba ennyimba ze n’abato ne bayimba ezaabwe. Singa aba Eagles baatuukirira Moses Matovu owa Afrigo oba abantu abalala abaludde mu nsiike eno bandibadde babawabula. Kiki kye mufunye mu kweyubula kwe mukoze? Kye nsinze okusanyukira kwe kuba nti bwe tuyimba, oli n’asituka n’agamba nti nze eddwaaliro ly’e Kawolo ndiwadde ekyuma kino, ndiwadde kompyuta abasawo basobole okuwuliziganya ne bannaabwe e Bulaaya. Kino nze kimmala, kubanga n’ebintu bye tuyimba ebisinga si byaffe. Mwasinziira ku ki okulonda eddwaaliro ly’e Kawolo okuliwa obuyambi? Eddwaaliro bbi nnyo, liri ku luguudo lunene okubeera obubenje buli kiseera naye tebalina bitanda, amazzi tebalina, lirina ebizibu bingi. Naye mwanamugimu ava ku ngozi, kitange Dr. Charles L. Mugagga yakulirako eddwaaliro lino okumala ebbanga mu myaka gya 1980, ate maama Sr. Alice Mugagga naye yakulirako ekitongole ky’abakazi abazaala mu ddwaaliro lino ate nga nange nnalirabako nga likola. 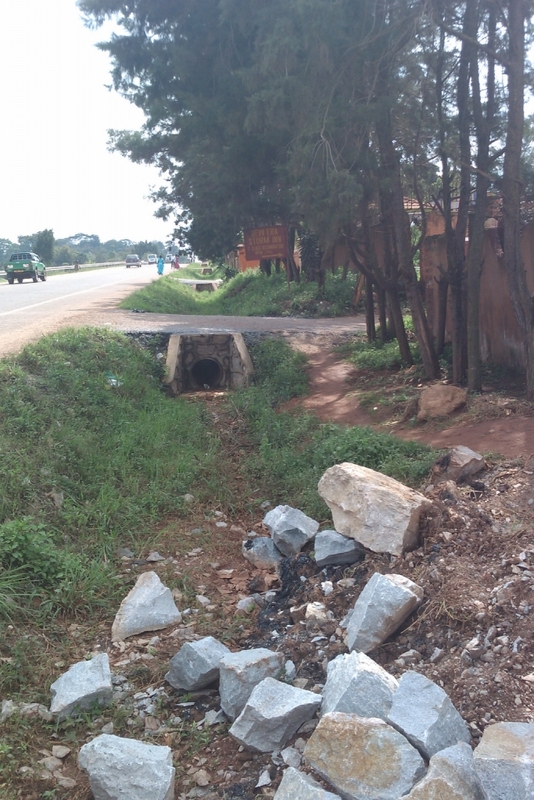 Sewerage pipes that are always blocked by condoms at the Masaka sewerage plant. Condoms flushed from the toilets of lodges in Masaka town and also dumped in the sewerage plant threaten the municipality's sewerage system functioning. 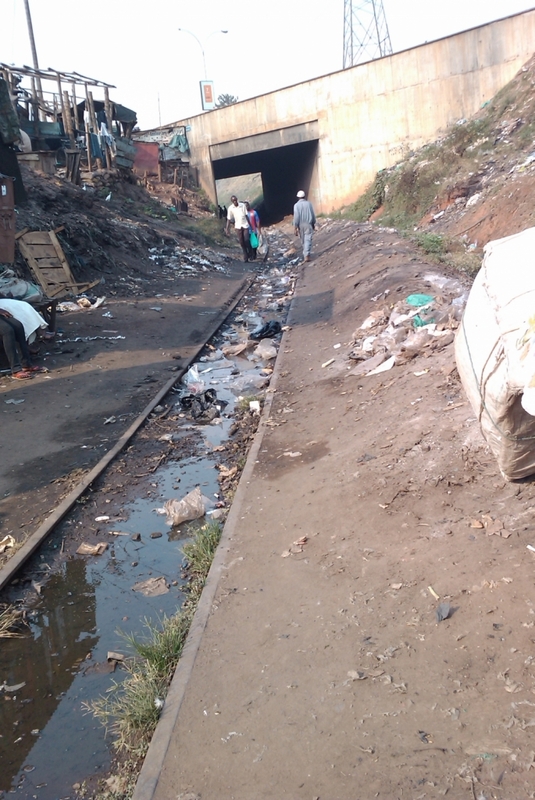 The National Water Sewerage Corporation (NWSC) sewerage plant that was built in 1952 has been intruded by town dwellers who dump condoms and polythene bags into it. "The condoms and dead animals like dogs and cats and are being dumped into the sewerage plant and they cause blockage, making workers to constantly unblock the manholes," Joseph Mugenyi the area manager NWSC Masaka told MPs of Parliamentary Forum on Water, Sanitation and Hygiene and officials from Uganda Water Network (UWASNET) on Friday. The group of legislators was on a field tour to assess the implementation of WASH programme in the district. Mugenyi said his workers have a mighty task to prevent the municipality from being enveloped in filth if the sewerage overflows. "The workers keep monitoring and unblocking the manhole whenever they have been blocked by condoms to prevent the sewerage from overflowing. 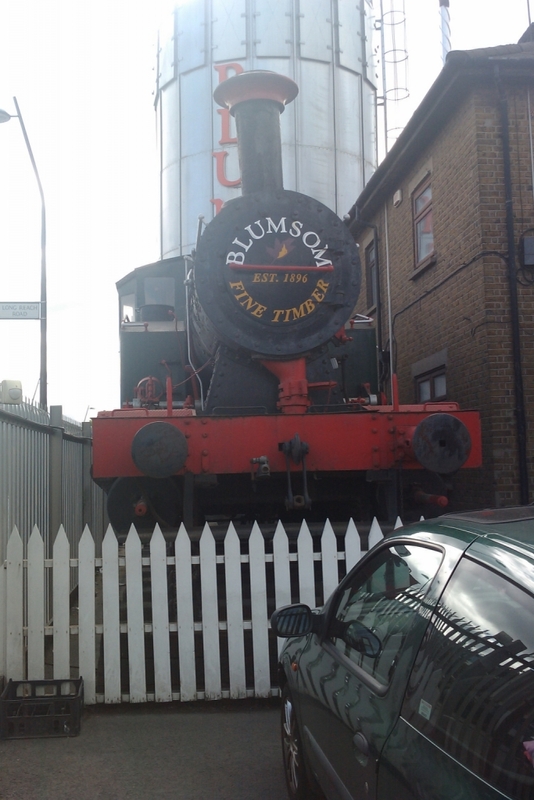 Otherwise, the whole town would be full of stench," he said. The water area manager said plans are underway to fence the sewerage plant to prevent residents of the town from dumping waste into it. A team of MPs inspected the plant on Friday. Workers always unblock the sewerage pipes. The sewerage plant was built 63 years ago. The vice chairperson of the Parliamentary Forum on WASH Ephraim Biraaro emphasized the need to sensitize the municipal dwellers on the dangers of flushing condoms into their toilet systems or dumping them in the sewerage plant. He appealed to the district leaders to sensitize the masses on the proper way of condom disposal. Biraaro also called for the implementation of the polythene bag law which banned its manufacture. Ngora Woman MP Jacline Amongin, who is also the chairperson of Parliamentary Forum on WASH, called for more funding for water, sanitation and hygiene. She asked the district authorities to prioritise sanitation and hygiene. The MPs were also shown new technologies of water source and harvesting in Kalungu. Lawmaker Hatwib Katoto warned that if the district authorities don't take action the municipality would experience an outbreak of cholera. NIGERIA, Lagos A cash shortage caused by low oil prices has forced Nigeria to borrow heavily through the early part of 2015, with the government struggling to pay public workers, officials said yesterday. “We have serious challenges. Things have been tough since the beginning of the year and they are likely to remain so till the end of the year,” said Finance Minister Ngozi Okonjo-Iweala. Nigeria, Africa’s top economy and largest oil producer, has been hammered by the 50 per cent fall in oil prices, with crude sales accounting for more than 70 per cent of government revenue. “As it stands today, most states of the federation have not been able to pay salaries and even the federal government has not paid (April) salary and that is very worrisome,” said Imo state governor Rochas Okorocha. It seems that Third World countries have a long way to learn how to handle their economies with a bit of caution. It is bad indeed to put ones eggs in one basket. Regional Tier for the Kingdom of Buganda was refused many years ago. With such an arrangement there is no need to have a lukiiko , or use the name Katikkiro or refer to Kabaka. 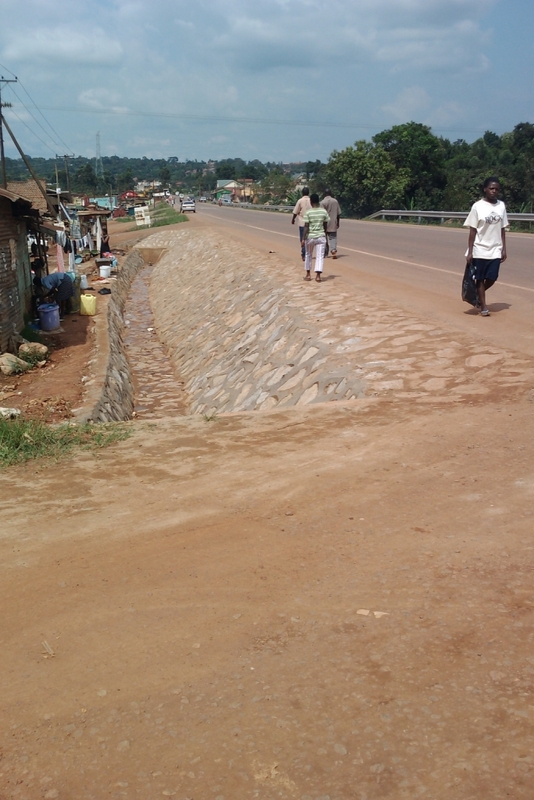 They can call him Governor or District Head and seat him anywhere but not in Bulange. We may be back to the same old arguments. Central gov't will cede specified powers and rights to the Buganda Kingdom. 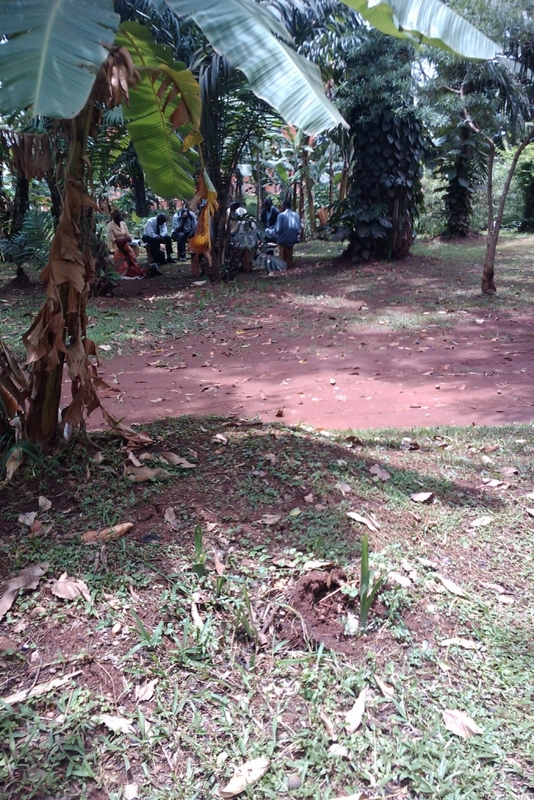 The citizens of Buganda Kingdom (who are these?) will elect a Lukiko (parliament) which will make laws to govern Buganda Kingdom. The Lukiiko will appoint the Katikioro (Prime Minister or President) who will head a government or administration. .
4.The Katikioro is accountable to the Lukiiko, and the Lukiiko is accountable to Uganda Parliament. So where does this leave the Kabaka? What are his constitutional roles: are they spelt out in the Constitution you keep going on and on about? Mayiga is already a walking "former " Katikkiro. A lot has happened! of strength in a world filled with strife, discrimination and terrorism." his plans. However, his confidence seemed to evaporate when one Mrs.
everything presented by Mengo so far were just concepts, not real plans. to Mengo Lubiri, since they were used to cows. may replace Kabaka Mutebi, as they have done to other Kabakas in the> past. foreigners and not some other land. committees” since it was sensitive. A day later, the official Buganda Government website, www. contract ends only 3 months away in May 2017.
lease Mengo Lubiri to foreigners, since February 25, 2015. 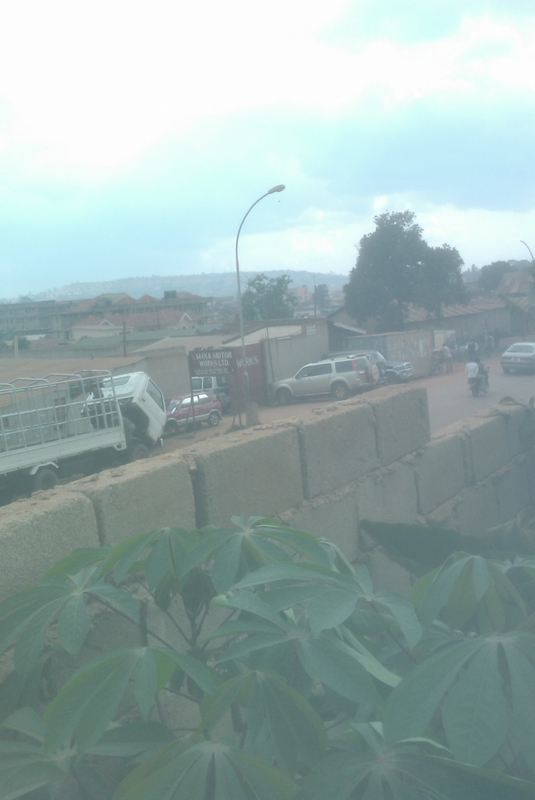 Kampala.UGANDA. The European Union has become the latest group to rattle government, saying it shares the concerns of the Uganda Human Rights Commission (UHRC) about delays in passing electoral reforms. In a statement on Wednesday, EU Ambassador Kristian Schmidt signalled that with less than 12 months before the February 2016 poll, time was running out, backing a view taken in the latest UHRC annual report. “With less than a year left to the next elections, electoral reforms need to be prioritised and implemented if they are to be effective and credible. The report is an important and highly relevant contribution by an independent body to the electoral reform debate,” Mr Schmidt said. The EU is among Uganda’s leading development partners. The envoy also observed that in the last 12 months, it was pleasing to witness vibrant public debate on electoral reforms which has resulted in a number of concrete proposals. Mr Schmidt’s statement came hours after a government reaction suggested it was reeling from the hard-hitting report by the UHRC. “The EU, therefore urges the government to act promptly on the proposed reforms to ensure a level playing field and transparency in the 2016 General Elections,” the statement said. Government spokesperson Ofwono Opondo, who had on Tuesday said the report was “shallow and unfortunate”, again took a dim view of this latest in a rising chorus of criticism about the handling of the run-in to the 2016 election. “If you fast-track electoral reforms, what evidence is there that there will be consensus building and a good outcome? 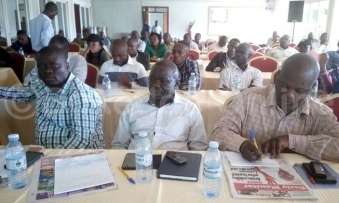 There is no guarantee that if we introduce the electoral reforms now there will be positive response,” Mr Opondo said. But with the pressure for reforms building, government seems to be flip-flopping on when it will table them. 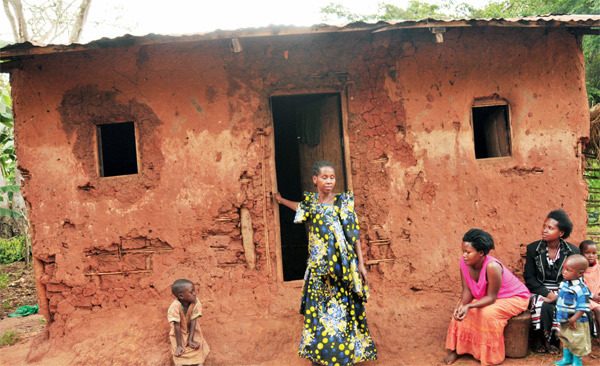 Premier Ruhakana Rugunda last week back-tracked on a promise, saying it would be “erroneous to make false deadlines”. Shadow Justice Minister Medard Sseggona yesterday indicated that the Opposition has now learnt of a plot by the government to shoot down Opposition plans to table a Private Members Bill on the constitutional amendments to ensure reforms. “They have taken that decision that they will use their numbers to block us from taking leave of Parliament to prepare our Bill and that we will not be given a Certificate of Financial Implications (a key technical requirement for Bills). We are not deterred. We are preparing our Bills and will cross the bridge when we get there,” Mr Ssegona said. Pulezidenti Museveni ne mukyala we, Janet ne bannaddiini oluvannyuma lw’okusaba ku Ssekukkulu mu kkanisa ya St. Luke e Nshwere mu disitulikiti y’e Kiruhura. PULEZIDENTI Yoweri Museveni alabudde abatiisa okuleeta obutabanguko mu ggwanga mu kiseera ky’okulonda n’agamba nti tajja kubakkiriza. Yabadde mu kkanisa ya St. Luke Church of Uganda e Nshwere mu disitulikiti ye Kiruhura ku Ssekukkulu. Yasuubizza nti abantu tebasaanidde kutya nti eggwanga liyinza okufuna obutabanguko okuva mu kulonda n’abagumya okusigala nga bakkakkamu. Yabadde ayanukula Muky. Esther Magagga, eyategeezezza nti mu kiseera kino abantu abamu bali mu kutya, olw’enjawukana mu bantu abawagira ebibiina byobufuzi ebyenjawulo. Museveni yagambye nti abalowooza okutabula emirembe bajja kukolwako. Mu kwogera kwe, era Pulezidenti yawabudde abalunzi mu kitundu okwewala omujjuzo gw’ente, n’ategeeza nti ng’oggyeeko okukosa ente zennyini, kyonoona n’omutindo gw’ettaka. Yabakuutidde okwawula mu ttaka lye balina, balundire ku limu okumala ekiseera ekigere. Yasuubizza okukola okukola oluguudo lwe Nshwere. Ate Muky. Janet Museveni yasabye Bannayuganda okwongera okuwagira gavumenti ya NRM, kuba y’esobodde okuleeta obumu mu bantu bonna. Yasabye wabeerewo okutabagana mu bantu abalina wadde balina endowooza z’ebyobufuzi za njawulo. Museveni ng’akutte mukyala we Janet ku mukono. Bamuseveni nga bayimba mu kusaba ku Ssekukkulu. Museveni nga tannaba kugenda Kiruhura kukuza Ssekukkulu, yakubye olukuhhana lwa kampeyini ku ssomero lya Nakalama Primary School e Kigulu South gye yasuubirizza abantu b’e Iganga bw’agenda okussa essira ku kutumbula eby’amazzi n’okukola enguudo mu kisanja ekiddako. Yasuubizza okwongera okusima nayikondo mu byalo, kuba obubuga bungi nga Namagera, Ndodwe, Nambali, Idudi, Namungaalwe bugenda kufuna amazzi ag’emidumu. Waakugattako okubunyisa amasannyalaze mu kitundu kya Kigulu South kyonna. 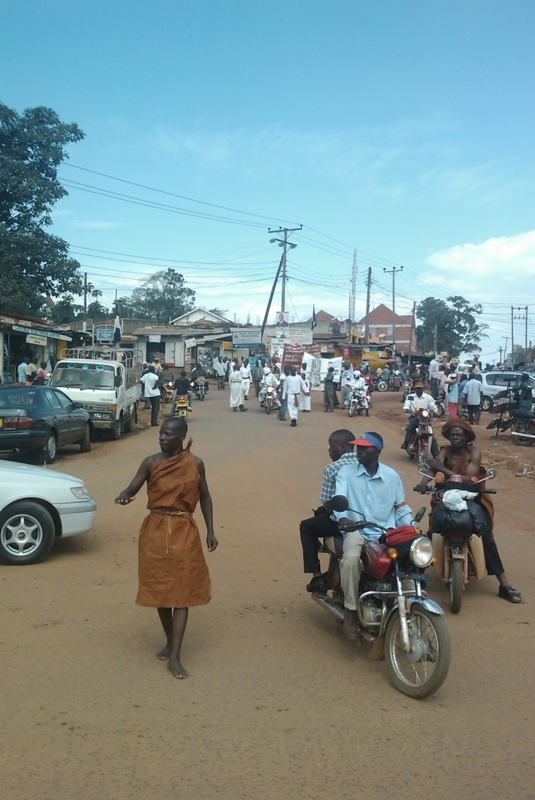 Yategeezezza nti oluguudo lwa Iganga-Tirinyi-Mbale lukolebwa ku buwumbi 73. Yasuubizza okukola olupya oluva e Iganga okuyita e Kiyunga okutuuka e Bulopa. Olwaleero, Pulezidenti Museveni azzeeyo e Busoga ayigge akalulu akamuzza mu ntebe y’obwapulezidenti mu 2016. Eggulo ne ku Ssekkukulu yabadde awummuddemu eby’okunoonya akalulu. 1980-86 Ani oyo eyaleeta efujjo mukulonda nemukufuga kwa Uganda ate no nga obululu bwe nga omukulembeze tebubbiddwa? ABASUUBUZI abaddukanya emirimu gy'okusa obuwunga bwa Kasooli ssaako n'okukola obuveera mu lutobazi e Nateete bakung'aanidde ku Pope paul mu Ndeeba okusisinkana abakungu okuva mu kitongole ekikuuma obutonde bwensi ekya NEMA basobole okutema empenda ez'okusigala nga bakolera mu kifo kyabwe. Olukiiko luno okuyitibwa obukubirire kiddiridde ab'e kitongole kya NEMA okuwa abasuubuzi bano ekiwandiiko ekibagoba mu Lutobazi e Nateete kyokka nga abamu ku basuubuzi bagamba nti basobola okuteesa ne NEMA ne babaako enzikiriziganya gye batuukako. Abamu ku bakozi abeetabye mu lukiiko luno kuliko Mpoza Esao akulira ebya NEMA mu wakiso, Naluyiga Vannie owa Makula Grain Millers,Jackson Matovu owa Jassy Millers,Ian Katongole Byakatonda owa Byakatonda General Enterprises Uganda ltd ssaako ne Richard Sserwadda owa Real food Maize millers. Mubyalo mwe abasubuzi gyemuva ebibira mubimazeyo. Muli mubibuga entobazzi nazo zemukayanira. Enyanja Nalubaale yafa dda kubanga temukyali kyenyanja kilamu. Tunamala kulaba nga ebyeya NDEKA BUSA bitumalawo tulyoke tulye sserre nga bajjajja baffe bwebatulabula munyimba. Ekibuga Kampala tekirina national green parks abaana gyebagenda ne bazanya emizanyo nga bwebawumilirako eyo. Mwe abasubuzi nomululu gwa sente ababaka ba city council bemulonda mulabila ddala abo abanabakolera ekyo kyemwagala so si nga embeera zo budde mu kibuga kya ffeena ekya Kampala bwe sanidde okutukirizibwa. Mwe Abasuubuzi Abaganda nga mubyalo bwe mwayiga okulima emmwanyi ne ppamba kakano muyize ensimbi kukibuga. 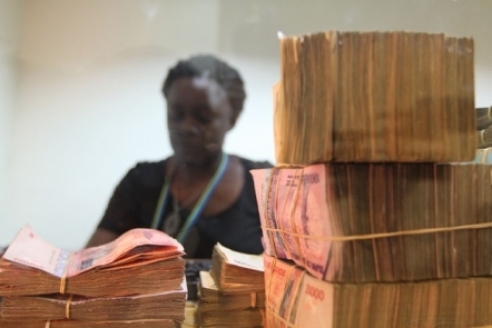 Omugaso gwentobazzi mukilaba nga kumala budde okujjako ensimbi. Era bwoyogera ne ku green parks mu bibuga mukiyita kwonona ttaka lya kibuga erisuubula ensimbi. Kyova olaba nga ekibuga Kampala kyekibuga kyokka munsi ekitalina national green parks abantu gyebagenda ne batuulako mumiti nemumuddo. Kitalo nyo. Electoral governance is very central in the transition to a democratic dispensation. In fact the appointment of the electoral commission is a test for whether the country has chosen to take the path of democratic transition or one of sliding back into authoritarianism. 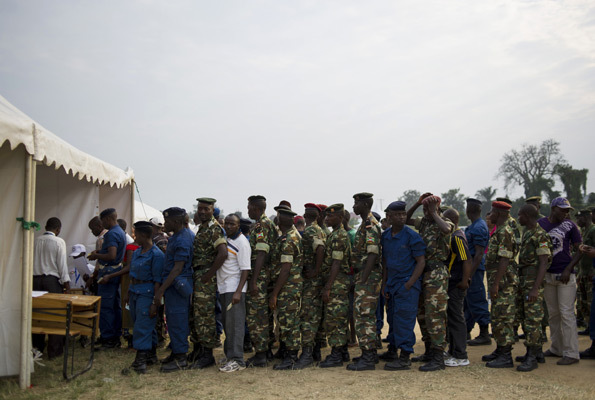 The nature of electoral governance can lead to conflict management or conflict escalation. Electoral governance can be a tool for fighting corruption or promoting it because those elected corruptly are more likely to engage in corruption after assuming the office but those elected with integrity are more likely to serve with integrity. Electoral governance can be used as an instrument of building political consensus in a country or as an instrument for political manipulation and therefore disharmony. Electoral good governance and management can be a tool for better management of diversity in a heterogeneous country like Uganda. A history of electoral governance in Uganda is a negative one. In the 1961 general elections, the potential voters in Buganda Kingdom were intimidated and harassed out of registration and voting but the then electoral commission did little to avert that practice. In 1962 elections and again especially in Buganda Kingdom the electoral commission appointed locally and controlled by the then Mengo government heavily rigged elections in favor of Kabaka Yeka party against the Democratic Party. In the 1980 elections the then head of state Paul Muwanga compromised the electoral commission results in favor of Uganda People’s Congress. Since the 1990’s the Uganda electoral commission has been accused of bias as manifested in the High and Supreme Court petition judgments as well as in the reports of election observers. There is a positive correlation between the conduct of the electoral commission and the quality of the democratic process in democratic transitions like Uganda. Actually in Sub-Saharan Africa, the countries that have been hailed for making headway in democratic transitions since the wind of change or is it the change in the wind of the 1990’s, are Benin and Ghana. It is no coincidence that the electoral commissions of these countries have also been rated among the best electoral commissions in respect of impartiality on the African continent. On the other hand the countries that analysts have placed in categories of democratic blocked transitions in Africa such as Togo and Cameroon have biased and partisan electoral commissions. Therefore the process of appointing electoral commissioners needs much attention and scrutiny. The following are the tips for appointing impartial and competent electoral commissioners; The person to be appointed a member of the electoral commission should have a history of impartiality in conducting public affairs. This person should not be holding nor should have held a political party position or post in the last five years. Note that there is a difference between a post and a position. A position is any high place within the hierarchy of a party such as an MP or party leader of any kind be it chairman or member of the executive. A post refers to employment in the party such as being a party civil servant at the national or district secretariat. She/he should be a woman or man of integrity with a history of interest in sacrificing and commitment to serve the common good rather than the private good. This person should have a demonstrated national outlook behavior and attitude and not parochial or tribal both in rhetoric and practice This person should either have expertise in managing public affairs or at least have knowledge of electoral systems and electoral governance. As they say a politician looks at the next elections but a statesman at the next generation. The authorities mandated to conduct the process of appointing the commissioners should be statesmen and women but not politicians. The vetting process for appointing the new commissioners should also be subjected to public scrutiny. The parliamentary appointments vetting committee should allow public participation and interaction. There should be public hearings and comments as is the practice in the other standing committees of parliament. Of course it would have been better if the constitution was reviewed and a less politicised body such as the judicial or public service commission ideally select, interview and recommend to the president for appointment. Thereafter parliament would come in to vet the names as a matter of formality. In my opinion the politics of constituting the electoral commission and the mode of appointing this important body will either build or destroy Uganda depending on whether the men and women in the political class decide to be statesmen and look at building for the next generation or decide to be politicians and look at how to win the next elections. A transparent exercise for appointment of the commissioners and the executive secretary of the electoral commission is the only guarantee for the independence, impartiality, non-partisanship, credibility and legitimacy of the commission and by extension for elections in Uganda. The long serving government of NRM by banning the political party of Kabaka Yekka in this country, one cannot see how it has improved the process of modern democracy! 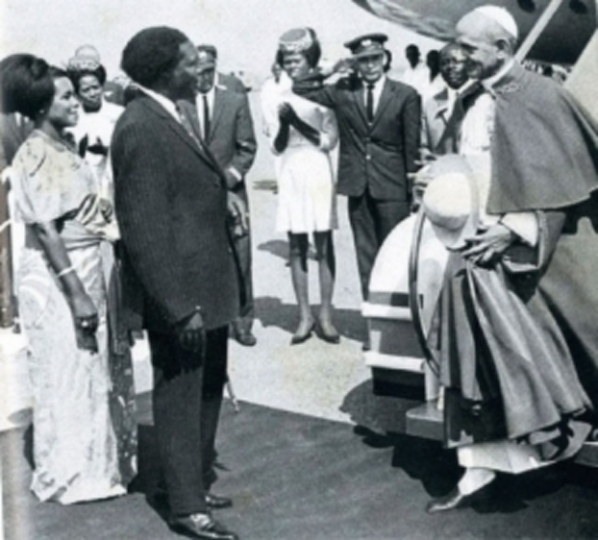 Pope of Rome Paul VI at Entebbe Airport, Buganda State. Abantu mwenna muyitibwa okubaawo ku mukolo ogwokutongoza olukiiko lw’omukungu wa Ssaabasajja e Manchester n’omwoleso gw’ebyobuwangwa (Buganda Cultural Festival) ku Lwomukaaga nga 14th November 2015. Omukolo guno mawuuno, gugenda kubeera ku Parrs Wood High School Main Hall, Wilmslow Road, Manchester, M20 5PG okutandika ku ssaawa musanvu (1pm). Okuyingira kwa bwereere; era mu bitegekeddwa okukolebwa mulimu; Omusomo ogukwata ku nnyanja ya Kabaka, amazina ag’ekinnansi,ebitontome, empaka z’okusiba busuuti/gomesi, empaka z’abaami okuwaata amatooke, okwolesa emisono gy’engoye, empaka z’abaana okulanya n’okuyimba ekitiibwa kya Buganda,omweso, ekigwo ggumbya, okusika omugwa;okugaba ebirabo ne satifikeeti,n’ettoffaali n'era n'era. Eby’okulya n’okunywa ttomooni ate nga byonna bya bwereere! Omugenyi omukulu ye mubaka wa Ssaabasajja mu Bungereza ne Republic of Ireland, Owek. Ronald Lutaaya ng'ono y’agenda okukola omukolo ogw'okutongoza omukungu wa Ssaabasajja e Manchester n'ebitundu ebiriranyeewo, Enock Mayanja Kiyaga, wamu n'olukiiko lwe. Guno gwe mulundi ogusoose Manchester okufuna ofiisi y'omukungu wa Kabaka nga kino kyaggyawo oluvannyuma lw'enkyukakyuka Ssaabasajja ze yakola mu baami be abamukiikirira mu mawanga agali ebweru wa Uganda omuli ne Bungereza n'asiima ne Manchester efune omukungu ng’era ababaka abapya baalangirirwa mu mwezi gwa February omwaka guno 2015. Mu ngeri y’emu, Ssaabasajja yawa abaami be yalonda obuyinza okwerondera obukiiko mu bitundu byabwe bwe banaddukanya nabwo emirimu. Mu bagenyi abalala mulimu Omubaka wa gavumenti eyawakati mu Bungereza (Uganda High Commissioner mu UK) Polof. Joy Kikafunda, abakungu ba Ssaabasajja abalala mu Bungereza omuli Robert Mukiibi (North London), Kasimu Muguluma (South London) wamu ne Rebecca Lubega-Bukulu (Scotland), abalangira n'abambejja, abakulembeze b'enzikiriza ez’enjawulo wamu n’ab’ebitiibwa abalala bangi. Omukolo guno gusuubirwa okugatta Bannayuganda bangi ddala okuva mu bitundu eby'enjawulo omuli Greater Manchester, Liverpool, Sheffield, Birmingham, Coventry, Leeds, Derby, London n’ebitundu ebirala byonna mu Bungereza, Republic of Ireland ne Bulaaya ng’era gutambulira ku mulamwa ogw’okwegatta n’obumu okuyita mu by’obuwangwa. E Manchester awagenda okubeera emikolo, abatuuze mu kiseera kino bali mu keetalo nga beetegekera empaka z’omwoleso gw’eby’obuwangwa ogwesungiddwa ennyo. Akulira enteekateeka zino, omukungu Enock Mayanja Kiyaga akubiriza abantu ba Ssaabasajja ne Bannayuganda bonna okwetaba mu mpaka zino ez’okwolesa obuwangwa n’obumu mu Bannayuganda e Manchester ne Bungereza yonna. Kiyaga agamba nti ku mukolo guno, buli muntu yenna ayanirizibwa okujja okwolesa eby’obuwangwa bwe awatali kusosola mu mawanga, eddiini oba enzikiriza mu by’obufuzi. Kwo okutendekebwa mu mazina ag’ekinnansi n’ennyimba kwatandika omwezi oguwedde era nga kubeerayo buli Lwakutaano ku kitebe ky’ekibiina ekigatta Bannayuganda mu Manchester (UCOMM) ku Surcon House, Copson Street M20 3HE Withington Manchester era ng’enteekateeka zino zikulirwa James Bateeze ate nga ye Martin Pande y‘atendeka abazinyi b'amazina amasoga. Bbo abaami abagenda okwetaba mu mpaka z’okuwaata amatooke bawandikiibwa Haji Mustafa Ntambi Ssengo, empaka z’ekigwo gumbya zitegekebwa Haji Rajab Bbosa ate ye Kayemba Edward Kayondo n’ategeka omweso. Omulangira Ronald Wampamba y’avunaanyizibwa ku mpaka z’abaana okulanya n’okuyimba ekitiibwa kya Buganda, Sheikh Mustafa Ahmed Kawooya y’akola ku mpaka ez’okusika omuguwa, Allan Ssemanda y’awandiisa abaami abaneetaba mu kwolesa ekkanzu n’ebyambalo ebirala eby’ekinnansi, ate Betty Mirembe Jjemba ne Sylvia Bateeze be basunsula abakyala abaneetaba mu mpaka z’okusiba ggomesi n’engoye endala zonna ez’ekinnansi. Wategekeddwawo n’empaka z’abaana okumanya ebikwata ku bika byabwe n’ennono ezikulemberwa Brenda Ssempasa. Abalala abali ku kakiiko akateesiteesi kuliko; omuwandiisi Isaac Jakira, Ssaabakunzi Joel Kasagga Nyanzi, Ivan Ssonko Lutaaya, Leilah Batamuliza, Adam Lutaaya, Christopher Boma, Cliffe Ndahiro Kyobe, Juliet Boma, Fauzia Namakula Khalid, Fredrick Mubiru,Nnalongo Ritah Mugabo, Maggwa Paul Kale, Damalie Ssentongo, Rehema Nnabukeera Kawooya, Sarah Mukaaya, Dickson Wasajja, ne Ronald Kamugisha. Mujje mwenna twetabe mu kujaguza eby’obuwangwa bwaffe, obumu n’okwegatta ate nga bwe tuyiga tusobole okuweesa Nnyaffe Buganda ne Uganda ekitiibwa. Abaganda abamu ku ffe mubika byaffe twagala kumanya Omulangira ki asaanidde okutukulembera mubuzibu Buganda bwelimu obwokufugibwa amawanga amalala obumbula! Bangi ku ffe tukooye kakati emyaka 30. Okuva omwaka 1986 okutuuka omwaka 2015. Ate nemabega okuva omwaka 1900 amawanga mangi ddala gatufuze nga tulinga abakiriza okubeera bwetutyo. Mujja kutusonyiwa abamu kuffe Abaganda bwetutasobole kujja kubegattako mubiseera bino ebilabika nga birimu ebizibu ebibundabunda enyo munsi nyaffe Buganda. Essanyu eryomukolo guno nsaba Abaganda banange tulitereke okutuusa ekiseera ekiggya mumaaso. Ekibiina kya KY government eno yakiwera kakati emyaka 27. Olunnaku 11/05/2005 omusango guno lwegwatwalibwa mu court ya Uganda. Era empoza yagwo elambikiddwa bulungi kumukutu gwa website: www.kabakayekka.org.uk. Naye no bwotunulira obunafu obuli mukuzimba ensi eno kyeralikiriza buli muntu alabako. Ate no nokuganira mubufuzi okwa NRM kirese okwelalikiriza abantu ba Uganda. Kubanga omulimu gwokukulembera abantu ba Uganda tekibanga kya muntu omu yekka okukikola. Era sikibiina kyabufuzi kimu kyokka bwekiti. Ensi Buganda yafuna obwetwaaze bwebyobufuzi nga 8 October 1962. Uganda nefuna obwayo nga 9 October 1962. Ensonga zino zagala kuleeta nate entalo ezomuddinganwa wano mu nsi Buganda ate ne munsi ya Uganda yonna. Kubanga entalo za Uganda buli kiseera zibadde zakulwanyisa omufuzi aganidde mukifo kyo bufuzi nebanne batese mubifo ebyobuyinza. Obuzibu buno buleese okufirwa obulamu, ebintu byobulamu nokudda emabega nga ensi nyingi ezitalina ntalo zo zeyongera kugenda mumaaso okwewanirira mumbeera zaazo ezikuma abantu bazo. Ate no ensi Buganda nga ogase ko nensi endala 12 zezakiriziganya mu 1960 okutondawo omukago gw'ensi ya Uganda. Era ebibiina byobufuzi ebyali bikwatagana nabantu bensi zino mumwoyo omulungi OGWOBUNTU BULAMU nekakati ebimu webiri naye ekya Kabaka Yekka kyo kyawerebwa ekibiina kya UPC eky' Obote. Amin ye ebibiina nabiwera byonna. Kakati M7 okuva lweyajja ebibiina ya biwererawo mangu ago, naye oluvanyuma nakiriza ko ebimu okwewandiisa bimuvuganye. Ekibiina kya KY kyagezaako okwewadiisa naye nekiganibwa nga website: www.kabakayekka.org.uk. bweraga. Olupapula lwa Monitor ne mpapula endala nyingi zilaga bulungi ebibadde bikolebwa mu bufuge bwe bibiina bino mumyaka gyonna kasokedde M7 awamba bufuzi bwa Uganda ate era ne Buganda mu mwaka 1986. Ebyenfuna, amalwaliro, ebyokusoma nebirala bingi nyo governmenti byetekwa okukolera abantu bensi tebikoleddwa bulungi ate nga emyaka 27 mingi nyo ddala governmenti okubako ekyamanyi kyeyinza okukolelamu emirimu gyayo abantu bensi nebasiima. Omuntu yenna omulamu ebiro bino 2014 yelabirako ye kenyini ekibiina kya NRM bwekibadde kyeyisa nga kiri mubufuzi bwa Uganda. Ekibiina kya Kabaka Yekka kisaba abatuuze bonna aba Uganda ebiseera bino belowooze nyo kuntegeka zabwe ezitwala ensi ya Uganda mumaaso. Era okwetaba mu kulonda kwa National Resistance Movement okukolebwa buli myaka 5 kyongera kulwaza ensi eno obulwadde bwebyobufuzi obulabika nga tebujja kuggwawo. Okulekerawo okwetaba mukulonda kuno kyekisanidde eri buli mutuuze ali mu ggwangga lino. Era entegeka weri okulaba nga buli Muganda yenna abeera musirikale eri munne okulaba nga ensi teyetaba mukulonda kuno okujja mu mwaka 2016. Ensi endala ezakola Uganda kizikakatako okugoberera ensi Buganda mukugana okwetaba mukulonda kuno okujja. Ebibiina byobufuzi mu Uganda ebyawandiikibwa ekibiina kya NRM byo birina endagaano nakyo okwetaba mu kulonda kuno era byamala dda okukuba ekirayiro okukuuma Ssematteeka wa NRM afuga ensi eno. Mukibiina kya Kabaka Yekka Political Organization. The traditional political party of Kabaka Yekka is effectively banned in the country of Uganda. The court case for the party to try and defend itself took place on 11/05/2005 at Kampala, Uganda. The details of this case are well outlined in legal form on the website kabakayekka.org.uk. The political party of NRM has done all it can to entrench itself in power and cannot hope to run and develop this country without the cooperation of the rest of the citizens of this country that might have a different political opinion from theirs. The country of Buganda which is the political base of this political party got its political independence before it joined the rest of the neighbouring provinces to make up the general independence of the country of Uganda. Lack of state respect for such an international agreement and obligation continue to cause incessant civil wars where people's lives and property are destroyed on a very large scale. Indeed countries that have no civil wars have a very high standard of development in this modern world. There are 12 African tribal states that made up the country of Uganda during the 1960s. The political parties that organized this international agreement are still in existance apart from the party of Kabaka Yekka. The government of President Obote banned the party of Kabaka Yekka. The government of President Idi Amin ruled by decree. When President Museveni came to power in 1986, he banned all these parties until these political parties came to an agreement to work with the NRM regime for their survival to be guaranteed. The party of Kabaka Yekka was refused this political opportunity to associate in the business of running this country. Every citizen of the country of Buganda and Uganda is well aware of the immense government inefficiencies the political party of the NRM has made in trying to develop this country. Lots of public publications have been printed out about this problem. The poor condition of the hospitals and the education system is an immediate social problem that concerns our lives. There are indeed many reasons why every citizen in the country of Buganda must not continue to participate in the general elections the NRM regime keeps putting up as a show of democracy to the international communities. After these incessant rigged elections this government rules the people of this country under the tyranny of NRM rule now 29 years. The political party of Kabaka Yekka advises all the citizens of the country of Buganda this time round not to associate and participate in the coming national general election scheduled to be exercised in the year 2016. Unfortunately for the many political parties that are registered under the banner of this regime these parties have an obligation to keep to their side of the political bargain they have made with the NRM tyrannical rule. For the tribal African states with their citizens, they have the advice and option to follow the political position of the state of Buganda and its citizens. Electoral Commission (EC) chairman Badru Kiggundu has directed Dr Kizza Besigye to stop his “campaign of defiance,” saying its tantamount to inciting violence during the election period. Speaking to journalists at the EC headquarters in Kampala yesterday, Mr Kiggundu said if Dr Besigye doesn’t heed the EC’s directive, he will face the wrath of the law. Dr Besigye has repeatedly on his campaign trail said the election will be won “not by compliance but by defiance.” He has also vowed not to go to court if there is vote-rigging, saying this will be sorted using people power. This has, however, attracted condemnation from the EC. “The commission has noted with concern the consistent calls by candidate Kizza Besigye for defiance as a campaign strategy. This kind of campaign is likely to have serious impact on the conduct of peaceful campaigns and elections,” said Dr Kiggundu. But FDC spokesperson Ibrahim Ssemujju Nganda said the campaign will continue. “What Dr Besigye is doing is prepare people to rise up in case they steal the election like they have always done,” said Mr Ssemujju, who is also the Kyadondo East MP. Bank of Uganda governor Tumusiime-Mutebile. The governor’s comments came after participants at the conference asked him to explain why the country suffered unprecedented inflation levels in 2011 just after the general elections. Kampala- Bank of Uganda Governor Emmanuel Tumusiime-Mutebile has said he was misled by the government into indirectly financing electioneering activities in 2011, an action which plunged the country’s economy into chaos. While addressing the 10th annual meeting of the African Science Academies at the Lake Victoria Serena Hotel on Tuesday morning, Mr Mutebile said although the Central Bank did not directly print money for the elections, there were indirect expenditures by the government into areas that were not transparent. “I can assure you that the Central Bank did not directly print this money but where government expenditure is directed to areas that are not completely transparent, I cannot determine how much of the money I have created ended up in political electioneering,” he said. The governor’s comments came after participants at the conference asked him to explain why the country suffered unprecedented inflation levels in 2011 just after the general elections. Mr Mutebile said the money was passed on to government through treasury bills but vowed that he would never do this again. “You should remember that the economy of this country was thrown into total chaos after the last elections allegedly because central bank had printed a lot of money to finance the elections,” he said. Deputy NRM party spokesman Ofwono Opondo questioned the governor’s sense of professionalism and also asks if he was placed at gunpoint to accept to do what he knew was wrong. He also said Mr Mutebile could not have funded NRM because it is not a company that can buy treasury bills. 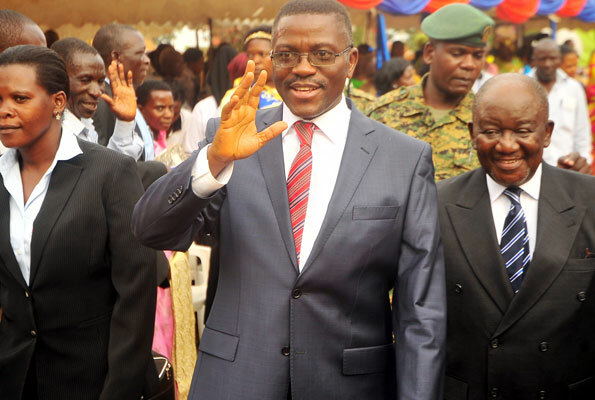 KATIKKIRO Charles Peter Mayiga alangiridde ng’olunaku lw’enkya nga 1st July 2015, gavumenti eyawakati bwegenda okukwasa Obwakabaka bwa Buganda ebyapa ebirala 82 wamu n’emmotoka ya Ssekabaka Muteesa II ey’ekika kya Rolls Royce ng’omukolo guno gugenda kubeera mu maka g’obwapulezidenti Entebbe. Mu April 2014 Pulezidenti Yoweri Kaguta Museveni yakwasa Buganda ebyapa by’ebifo 213 nga kino kiva ku ndagaano eyatuukibwako wakati wa Kabaka ne Museveni nga August 1,2013 okukomyawo ebintu bya Buganda ebyanyagibwa gavumenti ye yali Pulezidenti wa Uganda Milton Obote mu 1966. Bino abyogeredde mu Lukiiko lwa Buganda olw’omulundi ogwa 22 mu Lutuula lwaalwo olw’okutaano nga lukubirizibwa Sipiika Nelson Kawalya nagamba nti Kabaka yaweze ababadde basamirira mu masiro e Kasubi. 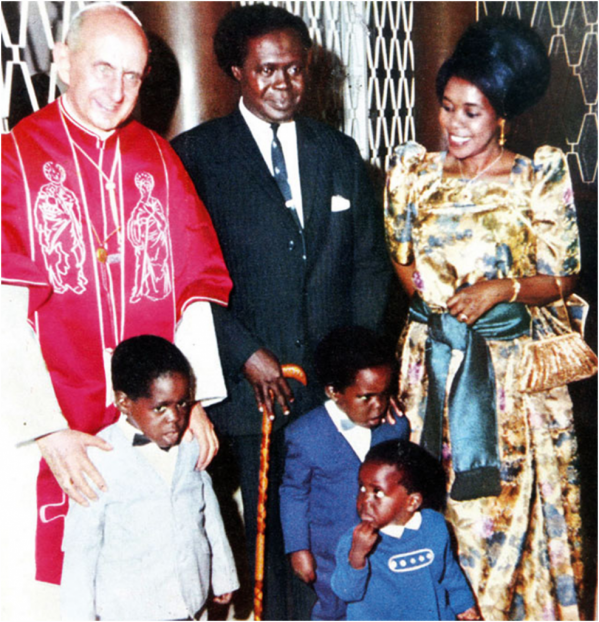 The self- imposed former President of Uganda Mr Obote greets the Catholic Pope of Rome.